The Lighthouse will close early on Christmas Eve so that our staff can get home to their family and friends. Hours on December 24 will be from 10 a.m. to 1 p.m., with the last Tower Tour at 12:45 p.m.
Point Arena Lighthouse Keepers, Inc. Members: Always free! For group rates please contact us in advance of your desired tour date by calling 877-725-4448, ext. 1 or by e-mail at info.palight@gmail.com. Point Arena Lighthouse Keepers, Inc. (PALKI) is a 501(c)(3) non-profit organization that owns the 23 acre Light Station and all the buildings and structures it contains. PALKI receives no funding from any government agency and is not part of the State or National Park system. We are completely dependent on our guests and members to “keep the light shining.” Your visit helps us maintain the Light Station for present and future generations. We appreciate your visit and support! 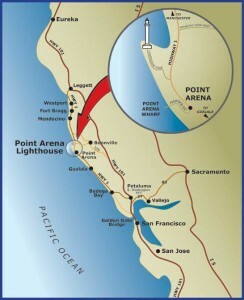 The Point Arena Lighthouse is just a 2 – 4 hour drive from most of the Bay Area and Sacramento, on one of the most beautiful roads in the world – California Highway 1. Take your time coming or going, use the turnouts to take in the amazing views and visit the many regional and State parks along the way.